This lovely and cute crocheted butterfly beanie is a quick and easy crochet project. For a little bit more “glamour”, attach a sparkly or pearl button to the middle of the “butterfly”. This adorable crocheted beanie with a butterfly motif is designed by Valerie Whitten over at Vallies Kids. She has designed a pattern in just one size. However, you can easily make adjustments to the pattern so that it will fit your purpose. 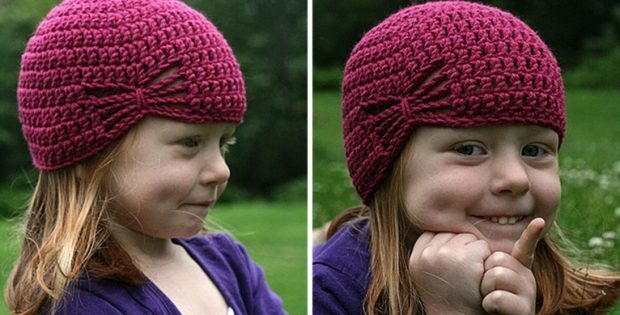 You can access the FREE pattern for this lovely crocheted kid’s hat from Valerie’s website. To access the free crochet pattern for this beautiful little beanie, please click here: Olivia’s Butterfly Pattern.